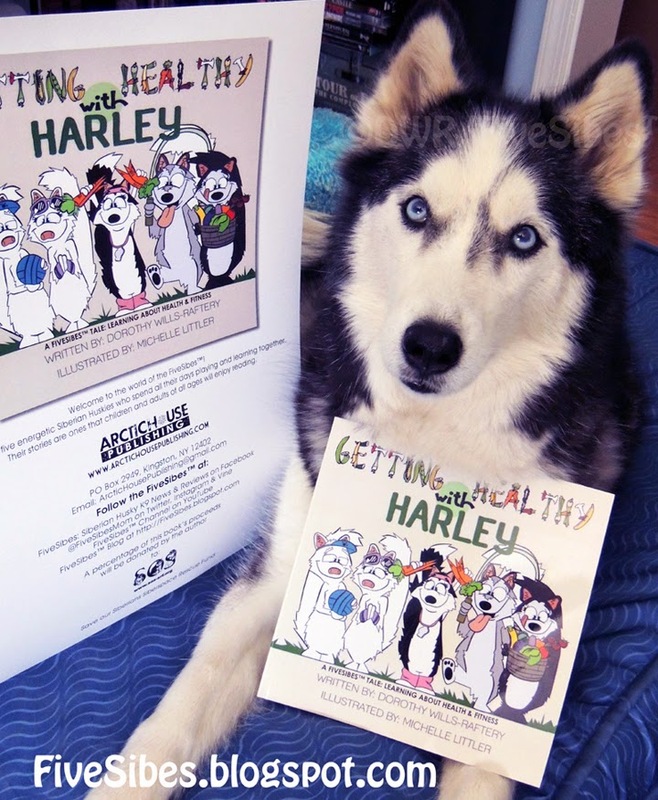 FiveSibes™: NEWSY TUESDAY: Newest FiveSibes™ Tale "Getting Healthy With Harley" is Released! 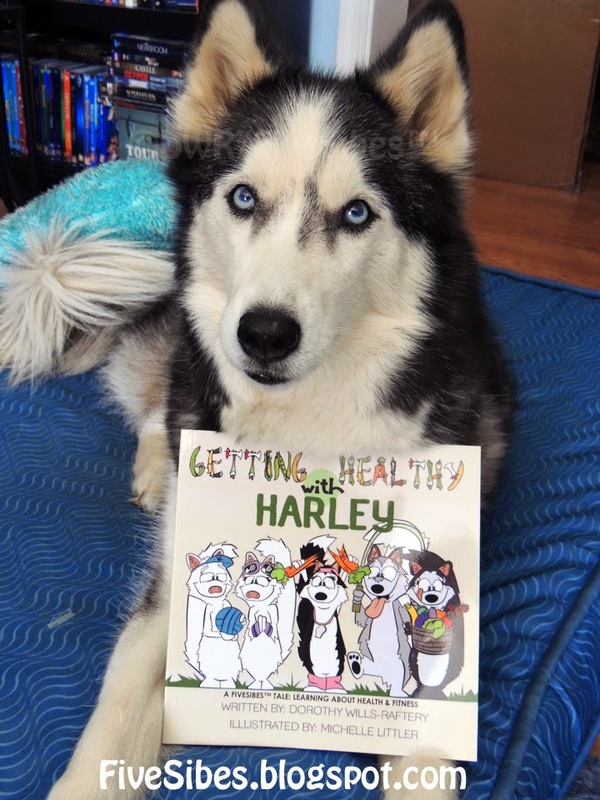 NEWSY TUESDAY: Newest FiveSibes™ Tale "Getting Healthy With Harley" is Released! We are so very excited here at the FiveSibes homestead! Harley has been wooing up a storm with some big news...my second FiveSibes illustrated children's book Getting Healthy With Harley: Learning About Health & Fitness has been published! And our alpha queen is so excited about starring in her own book! Think a canine version of Julian Michaels meets Jennifer Beals' character in the 1983 movie, Flashdance! And Harley wants to know if you'd like to know what else is cool about this book? 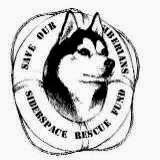 I'll be donating a portion of proceeds, after the cost of production, to help Siberian Huskies in need through the Save Our Siberians Siberspace Rescue Fund! Do I hear a "Woo-Woo?!" The adorable front and back covers of my newest FiveSibes™ Tale! With all the fun surrounding the release of this book, I thought our fans and followers would love to get to know a little about the awesome talent behind the pencil of our very talented illustrator, Michelle Littler. 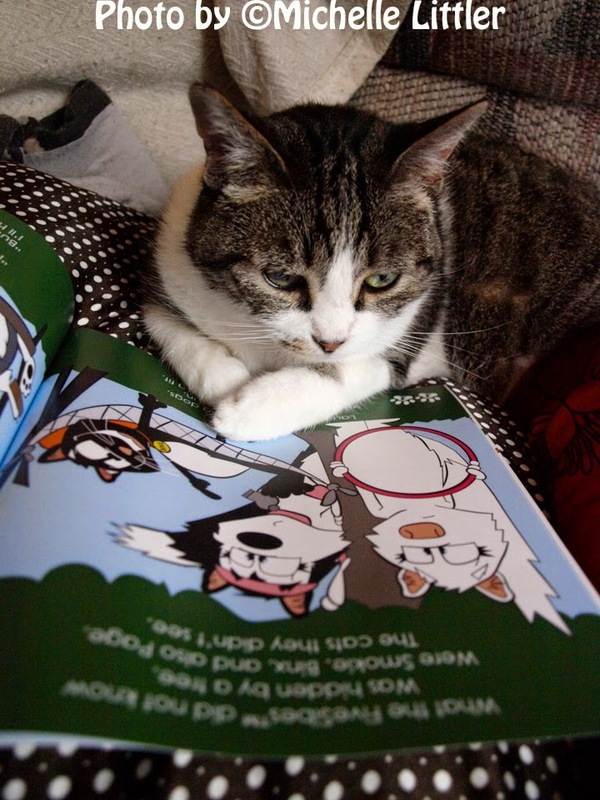 So grab a cup of coffee, call your children and furkids all around you, kick up your feet, and come meet our FiveSibes™ Tales illustrator, Michelle, in this fun interview! While this post is longer than usual, it's a very special one and you'll want to check it out and be sure to enter our Book Giveaway! We know you'll enjoy getting to know Michelle as much as we love her! And as a double-treat, Michelle and I are coordinating our blog posts, so be sure to check out her blog at www.MichelleLittler.com where she interviewed...you guessed it...me! And don't miss out on the Getting Healthy With Harley Rafflecopter giveaway at the end of this post and also over on Michelle's blog! FiveSibesMom (FSM): How and when did you first become interested in art and design? Michelle Littler (ML): Well as soon as I could hold a pencil I have been drawing and creating characters. I would fill a sketchbook every month with ideas, characters and cartoons. My grandmother would come up with stories and then have me illustrate them. So I don't remember a time where I wasn't drawing or creating. The Graphic Design aspect of it didn't come until college. FSM: What is your favorite part of illustrating? ML: Well there are two parts. 1) When I get an idea in my head and I can create it just as I imagined (I love that) and the second is taking what another person has in mind or just an idea and making their vision come alive. I love hearing "Oh, my gosh that's exactly what I was imagining! How did you know?" FSM: What was it about the concept behind the FiveSibes™ Tales and the first book of the series, What’s Wrong With Gibson? Learning About K-9 Epilepsy that you liked and agreed to sign on as the FiveSibes illustrator? ML: I have always wanted to illustrate a book and I loved the story and had already fallen in love with the characters from a previous project I had done with them. But with getting to know Dorothy (you!) and how you worked and really gave me creative license-that's when I knew it would be a great fit. All the pieces fit together well-sometimes you just know when you talk to someone you click right away and I think you and me clicked perfectly! 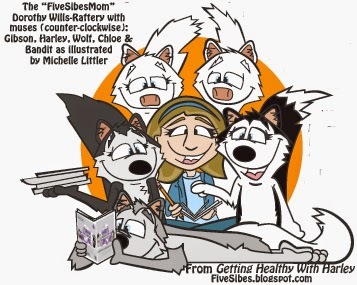 FSM: Having never met the FiveSibes or the author in person, how did you get to “know” them so that the illustrations actually depict the real-life nuances of each of the Huskies: Harley, Gibson, Wolf, Chloe, and Bandit? ML: Well, with any illustration, I always ask the person to give me as much detail of them as possible. And after looking at dozens of pictures, I had in mind their personalities and kind of developed what they would do in certain situations and tried really hard to make sure their individuality came out in ever drawing. After doing a few books know I feel like I know them and am very protective about how they are portrayed. I've even found myself saying "Chloe wouldn't do that!" FSM: What is the most difficult part of illustrating and your most favorite part? ML: The most difficult part is matching what you are envisioning with what the author is envisioning. Making sure you are being creative, but you aren't straying away from her vision. Although working with you we rarely have that problem. :) My favorite part is hearing the reaction to final product-whether it's from the author or fans. It's always amazing to see people reading and loving the illustrations you did. and of course nothing beats seeing in it print! FSM: Loaded Question (wink-wink), but I have to ask: How is it working with the author and FiveSibesMom, Dorothy Wills-Raftery (a/k/a me!)? ML: Honestly, it's one of the easiest relationships I have. I am always super excited to see what you have come up with and how excited you are about every project you do--it's easy to be excited and work for someone who shows that level of joy and personal connection to the project. Plus, I can be honest in telling you, "Hey, I don't think this is going to work or I would like to try this" and your totally supportive and on board. That is a rare thing for illustrators. So I am very lucky to be working with you because at the end of the day, it doesn't feel like work--it's just two people bouncing ideas around and being open to what's next! "Meoww...this is a really cute book!" FSM: What is your favorite part of the What’s Wrong With Gibson book? ML: I love when they are all in their jammies and each one shows their individual personality! FSM: When you submit the very first sketch in a project, what goes through your mind before you hear back from me/the author? ML: I was worried that what I had in mind for the illustration would be the complete opposite of what the author had in mind. Even though it gets easier I always hold my breathe until I get the "ok" because I'm always hoping they love it as much as I do. FSM: Are the FiveSibes Tales your first book projects? If so, what’s it like illustrating a book? ML: Yes. I have been playing around with illustrating my own book for awhile, but these are my first published books! Illustrating for a book is challenging because you not only have to make sure your one illustration looks good, but has to remain consistent throughout. I first have to read the story several times and then block it out and decide how to divide it in pages (this is what takes the longest). Also, making sure the colors are the same throughout. The test I usually apply is, if there were no words just pictures, would a reader still know what is going on? If it passes that test, I feel good about it. FSM: When you completed each, What’s Wrong With Gibson? and Getting Healthy With Harley, what was that feeling like as you look back over both of the books and the series as a whole project? ML: First there is a great sense of pride and accomplishment. I always say, "I can't believe I am reading a book with my illustrations!" Unfortunately, an artist thinks they could always do better so there are some that I am highly critical of and think "I should of done this" or "I shouldn't have done that" or little "mistakes" that only I notice. But, that's just me being nuts and those thoughts get overshadowed by how great they are. 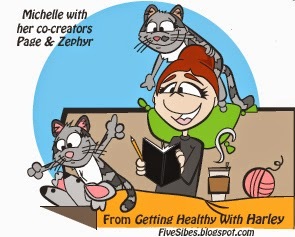 FSM: Your cats, Page and Zephyr, both make their debut in Getting Healthy With Harley. What is it like to have your kitties be part of the story? And will they be in future stories? ML: That's one of my favorite parts. They are absolutely the loves of my life (sorry, Ben) so to have them included makes it very special to me. I hope they will be in future stories! I try and sneak them in whenever I can. Plus, on a personal note, these were cats that were abandoned and abused so seeing them be a part of something that people love and people recognize them, it's a great thing to see. They are two of the sweetest cats in the world so to have them go from homeless too famous is amazing! 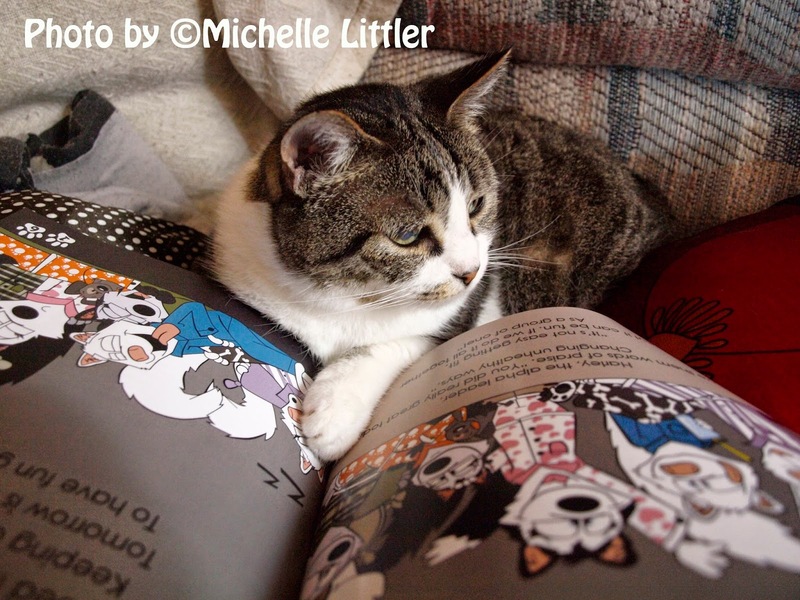 Yes, Michelle's cats really read the books! FSM: From their photos, I am absolutely certain they know how to read and proof! Are they your muses, and do they ever subliminally (or maybe not so subliminally!) offer suggestions to you? ML: I get ideas from them all the time. I think I mentioned to you that Zephyr plays fetch and you are going to try and make that a part of an upcoming book, so they influence my drawings all the time. And they absolutely know when I am drawing them because they will peek over my sketchbook or veto a drawing by sitting on it. I don't consider them animals, but little humans with fur because Page will flip through the pages of books and follow along with me and I'll ask Zephyr whether she likes how I drew her and she will shake he head "no." FSM: There are some upcoming books in the FiveSibes series that will be featuring some “extras” and special appearances by furpals. How fun is it to add these types of things to a story when you are creating the illustrations? ML: I love it! It's fun and challenging. Because you get so used to drawing the same characters, it's fun to now see how they will interact with different characters. One of my favorite pages in the upcoming book is when they are in the waiting room and surrounded by all different kinds of animals. These came from friends' pets and a lot of them were in tribute to pets that they had lost. FSM: The illustrations bring the author’s written word to life on the page – how fun is it to take someone’s words and create the images based upon those words? What is the hardest part and the easiest part? ML: It's fun when you like what the person has written! LOL! I love your stories, so it makes it easy. I think if I didn't like the story or the subject it would be incredibly difficult and that's why I'm so selective on the projects I take on. The hardest part is also the most challenging and that is I never know what you are going to bring me. I have to figure it out. So if you come up to me with a story about the FiveSibes meeting a gorilla, I have to figure out how to make that work. I can't just leave a part out of the book if I've never drawn it before. It definitely has made be a better illustrator! And luckily, you haven't come up with anything too crazy that I've said "Oh my gosh, I have no idea how I'm going to draw this" or "I can't draw this." FSM: Do you have a favorite Husky to draw out of the FiveSibes? ML: Oh, I see you're trying to get me in trouble! Well, it won't work! I love drawing them all the same. I will say I do have favorite poses or scenes that each is in, but no favorites for this illustrator. FSM: You also created the logo for the FiveSibes “The Sibe Vibe” Dog Works Radio show. How do you feel when you see something you created, such as the logo or one of the book covers, come across your social media or print media? ML: Honestly, it takes me a minute to recognize that I did it! LOL! I'll be like, "Hey, that's a cute logo" and then be like, "wait a minute, I made that!" There is nothing better (at least for me) than seeing work I've done in the world. That is the same when it's on a T-shirt, billboard, or in a book! FSM: What was your most favorite part of this new FiveSibes book, Getting Healthy With Harley? ML: Well, of course, I love that my babies are in it, but I also love Harley's 80s workout clothes--it cracks me up every time. I can just hear Olivia Newton-John singing, "Let's Get Physical" in the background! I also love the picture of them with the fireflies. That was inspired by me and my boyfriend, Ben, in our backyard. FSM: Comparing the first book to this one…what strikes you? Is there anything you did differently? Was it easier the second time around? ML: I think the second one was easier. You and me knew what to expect and how the other one works. We also had realistic time expectations that were hard to judge on the first one. The one thing I did differently was not drawing the book in order, which really helped. When I got an idea of a certain page that's what I would focus on instead of being SO concerned with sending them to you in order. I don't know if you loved that part (LOL! ), but it was really helpful to me. FSM: Tell us something about yourself that would surprise us! ML: I have a few. 1) I have never had a dog or been around dogs my entire life. 2) I never took an art class until college, so I didn't know if I was any good as my plans were to become a lawyer, and 3) My one cat, Zephyr, is blind in one eye, but you could never tell by the way she acts or in any of her pictures! FSM: You are currently working with the author on her third FiveSibes Tale, Cooking With Chloe, which has some pretty cool extras in it, as well as a bonus project. How much creative liberty do you get from the author while illustrating these? ML: Well, with our "super-secret bonus project" I have gotten to have full liberty since we are working backwards where I will be illustrating it and then you will be writing it (I can see people scratching their heads, but it makes sense to us!) Also, with this I felt more comfortable to offer some ideas and you were awesome to really listen and I think this next book is our most collaborative and definitely is a preview of things to come. And, again, if I didn't have such an awesome author that was willing to let me have those choices I don't know if there would have been more books, but know I don't want to stop them! FSM: The author (moi) has many ideas for future books in the FiveSibes series…how do you feel about that creative road ahead you are traveling down together? ML: I love it. I see the ideas getting bigger and the potential growing and I just can't wait to see the opportunities down the road and where this will take us. FSM: What do you like best about working with the author (moi), and being the illustrator of the FiveSibes Tales? ML: It doesn't feel like work. No matter what else I am doing I am always excited to illustrate them and I get as excited as the readers when you come to me with the next book. I think that is a rare collaboration. Plus they make me happy; if I'm in a bad mood or feeling blue, I draw Bandit or Chloe and I can't help but feel better. FSM: When the books are published and you receive your illustrator copies, what is the first thing you do? ML: I wait till Ben is out of the house because I attack it like a kid on Christmas morning! My first look is usually just looking at the pictures and making sure the colors came out all right, nothing got cut off, I didn't accidentally put girl eyelashes on Gibson. But, after that I sit down (with the girls) and look through it and read it. The day I get it, I will probably read through it at least four times. And then like every good daughter, I send my mom a copy because she is one of the FiveSibes biggest fans. I always have to laugh because as soon as I give her the latest book she'll ask, "And when's the next one coming out?!" FSM: If you had a creative wish for a FiveSibes project, what would it be? ML: I would love to see the book sold in stores and for a FiveSibes stuffed animal. I also would love to see them as an animated series. We have a great audience of fans now, but I just know if more people knew about it the more people would fall in love with them (and then you and me can retire to Vermont!) Doing the FiveSibes full-time I know is both of our dreams...and I can see it happening! Isn't Michelle just awesome? 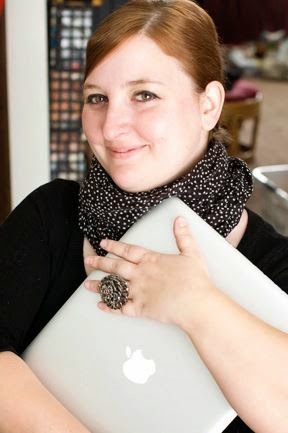 I fell very fortunate to have met her and that she is our official FiveSibes illustrator! I'm as excited about writing the next FiveSibes Tale as I am seeing what she will produce! Now what's a book release without a giveaway? 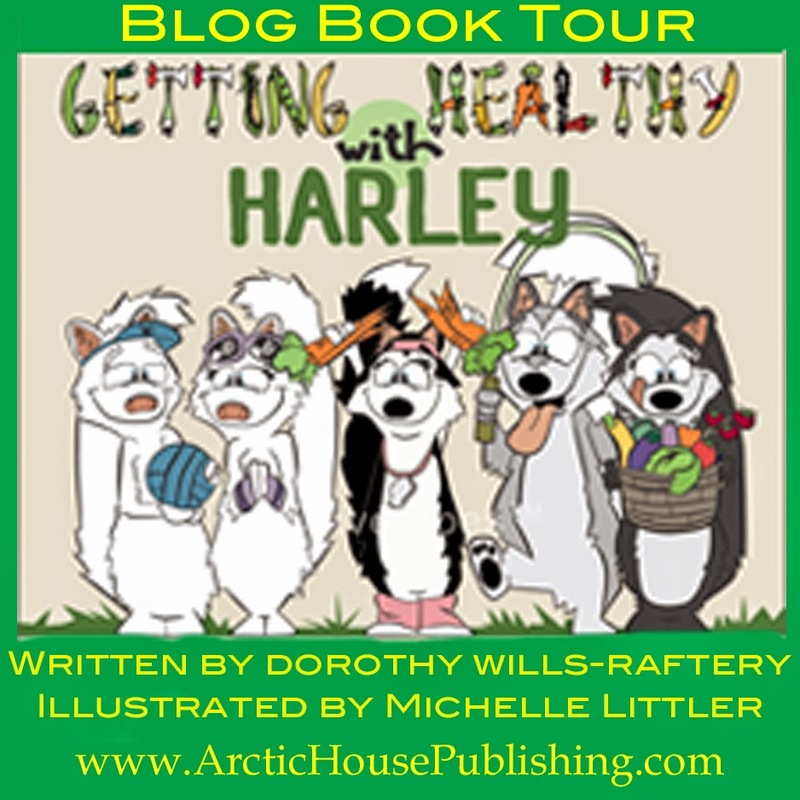 For a chance to win an autographed copy of Getting Healthy With Harley by both Michelle and I, be sure to enter the Rafflecopter below. It's a random drawing and in one week on *June 17th* not one, but TWO lucky winners will receive their own copies! And don't forget, we'd love to see photos of you and your furbabies with the book to add to our Blog Book Tour album that we share on Facebook and Twitter (and will be adding to our ArcticHouse website in the near future). Just Email them to us at FiveSibes(at)gmail(dot)com and put "Harley Book Tour Pics" in the subject line! Before we head off to the Rafflecopter...it would be (p)awesome if any of you would like to host us on our Blog Book Tour. All you have to do is a post about the book, a book review, or even an interview Q&A if you'd like, along with our book badge above. We'll happily share your blog post addy to direct folks to your amazing blogs, too! To be part of the Blog Book Tour, just drop me an Email at FiveSibes(at)gmail(dot)com and put "Harley Blog Book Tour" in the subject line! "Wooo! You can win my book! Jenna of HuskyCrazed ~and~ Cathy A.! Be sure to send us your "doghouse" addy so Michelle and I can each autograph the book and get it out to you both! Please give us a little time as we live states apart, so it will take a little time to get the books personalized and on their way! Woo! Congrats to you both! Bravo gang, that looks wonderful! Woohoo! I had a feeling that this was your big news!!!! Congrats!!! I'm so glad you got everything all published, and we really enjoyed your interview. We are now off to Michelle's blog too. I just entered the book contest. My Husky Isis is a therapy dog. If we win, we will donate the book to one of the libraries we volunteer at. Isis is great with the kids in the reading programs! A Fabulous Friday Gibson Update!